The Villagers of Little Hangleton still called it "the Riddle House," even though it had been many years since the Riddle family had lived there. "Harry Potter is midway through his training as a wizard and his coming of age. Harry wants to get away from the pernicious Dursleys and go to the International Quidditch Cup. He wants to find out about the mysterious event that's supposed to take place at Hogwarts this year, an event involving two other rival schools of magic, and a competition that hasn't happened for a hundred years. He wants to be a normal, fourteen-year-old wizard. But unfortunately for Harry Potter, he's not normal - even by wizarding standards. And in his case, different can be deadly." 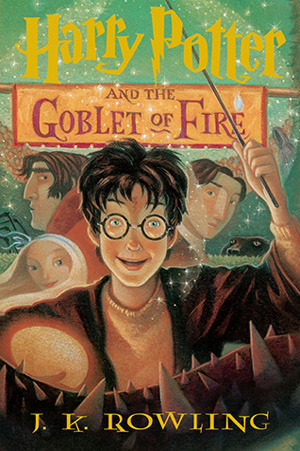 Harry Potter and the Goblet of Fire is the first of the big, big books that finish off the series (The Order of the Phoenix is the longest). I don't think it's the best of the later books, but one can certainly see J.K. Rowling stretching her wings even more, as she writes a much larger novel. The Triwizard Tournament is certainly fascinating as well, and makes for some great action and side-plots, as well as with all the other things that Harry's worrying about (although never does he have more to worry about than in the next book, The Order of the Phoenix). The Goblet of Fire is way more angsty; the characters are definitely teenagers now, and are trying to figure out shifting relationships and how they relate to one another. Never is this more apparent than Ron and Hermione; some of those sections were really amusing. They're constantly bickering. Ron and Harry also have a huge fight, which isn't amusing in the slightest. Other new things are fleshed out, such as who the Death Eaters are, and more about the dark days when Voldemort was in power. Harry and his friends go to the World Quidditch Cup, and Harry unexpectedly competes in something else entirely - the Triwizard Tournament. I found some plot holes in this book though, such as the fact that gillyweed isn't mentioned earlier in the book by Neville. Also, at one point Ron is talking about Percy "not recognizing a joke if it danced naked in front of him wearing Dobby's tea towel" (paraphrased). Well, if it was wearing a towel, it wouldn't be naked then, would it? Poor editing, or maybe that was the joke. I know, I know, one is not supposed to criticize Harry Potter, but there a few little incongruities that came to my attention this time around. It is a large book, and I'm sure it's super easy to miss certain things and not patch up certain holes. It's still a great story, after all, and the little things didn't bother me that much. More characters who will reappear in later books are of course added: Moody, Fleur, Viktor Krum, and Rita Skeeter among them. Of course, there are still many more that haven't been introduced: Tonks, Luna, and Kingsley. Lupin is not in The Goblet of Fire either, but he comes back in the next book. That's one of the joys of rereading this series: encountering familiar characters as you go on, and sometimes catching things you didn't before.